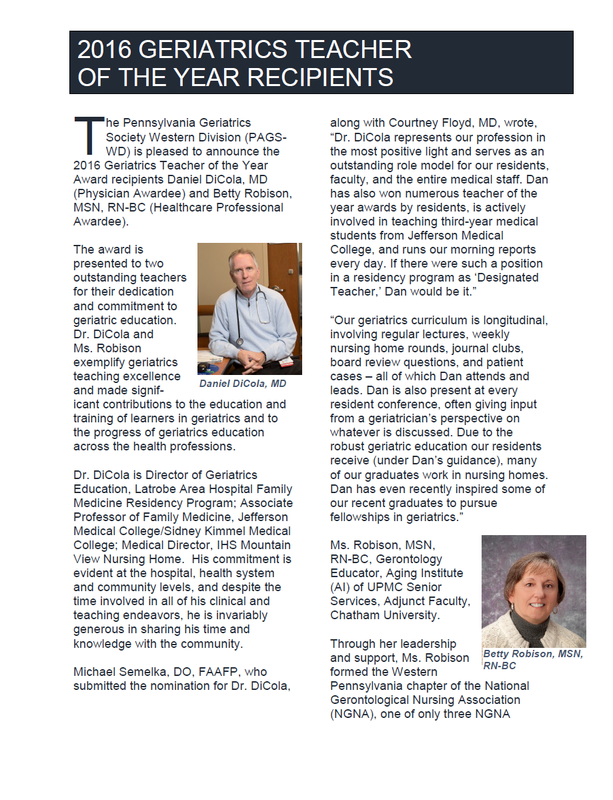 Purpose: The Geriatrics Teacher of the Year Award will be presented to two (2) outstanding teachers for their dedication and commitment to geriatrics education. 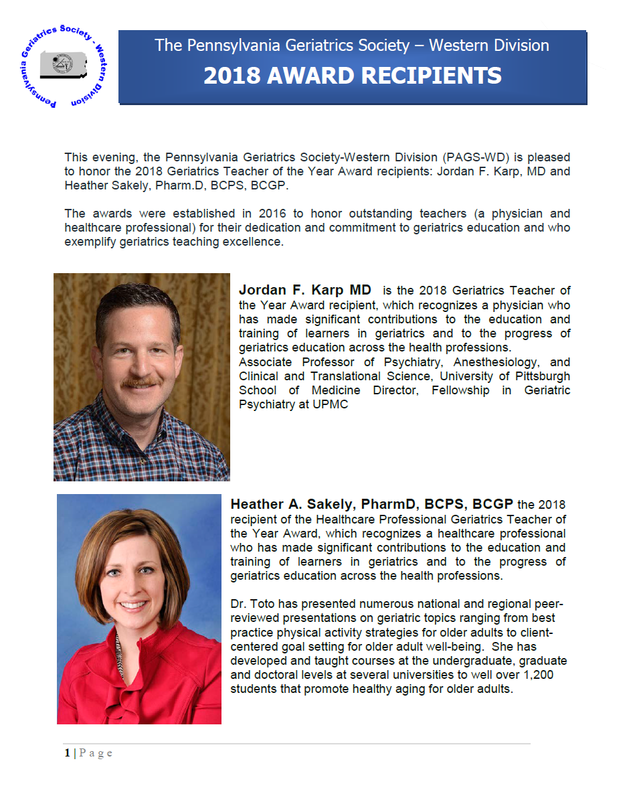 The Pennsylvania Geriatrics Society will recognize a physician and a professional from another healthcare discipline (ex. nursing, advanced practice, physical therapy, pharmacy, occupational therapy, dentistry, audiology, speech-language pathology, social work) for their geriatrics teaching excellence. 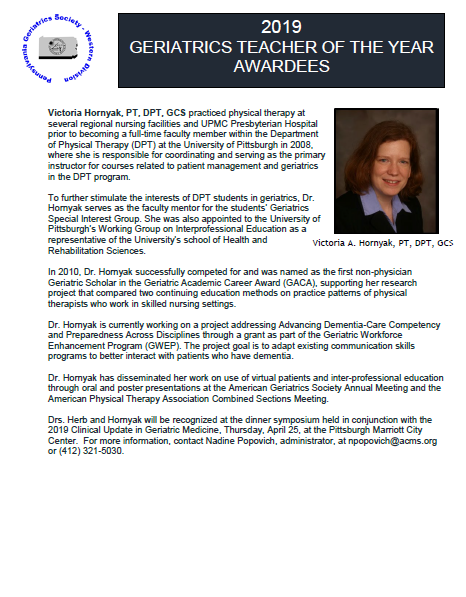 Eligibility: This annual award will honor both a physician and a healthcare professional who have made significant contributions to the education and training of learners in geriatrics and to the progress of geriatrics education across the health professions. Members and non-members of the Pennsylvania Geriatrics Society will be considered. Teaching expertise and/or education program development are valued in the selection of the recipient for this honor. Nomination Process: Nomination letters must outline the candidate’s specific contributions to geriatrics education according to one or more of the above criteria. One letter of support must come from a learner of the candidate being nominated.. The candidate’s updated curriculum vitae and one or two additional supporting letters of recommendation are required. Teachers who were previously nominated may be renominated if the nominator sends a brief update letter re-emphasizing the nominee’s unique qualifications, submits additional support letters, or submits an entirely new nomination letter(s) and updated CV. Winning nominations will be selected by the Awards Committee and presented to the Board of Directors for confirmation. 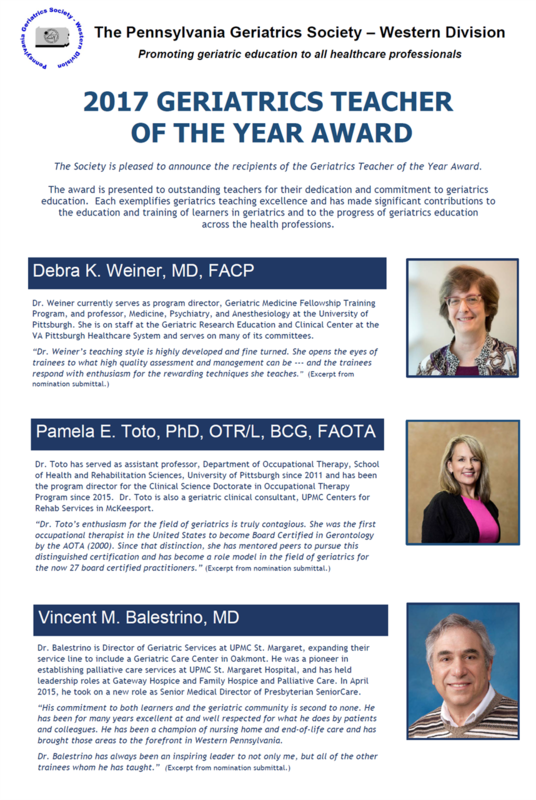 Award: To recognize his/her outstanding achievement, the Geriatrics Teacher of the Year awardees will receive an award letter and a plaque to be presented during the dinner symposium at the annual Clinical Update in Geriatric Medicine Conference. Each awardee also will receive a complimentary membership for the remainder of the year (non-member awardee) or a complimentary membership for the following year (member awardees). Call for Nominations begins October 4, 2019. 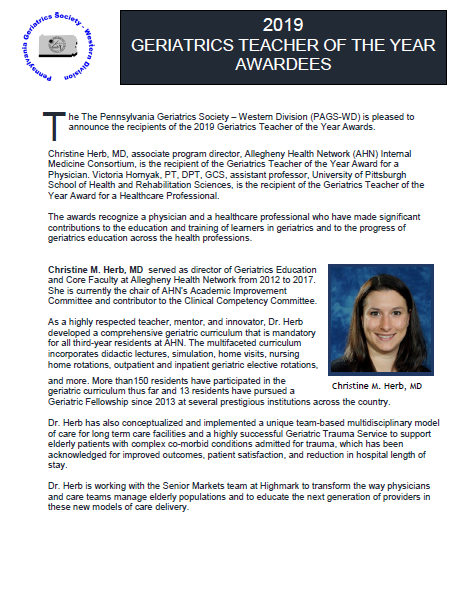 The Pennsylvania Geriatrics Society – Western Division is dedicated to improving the health and well-being of all older persons. It is a non-profit organization of physicians and other health care professionals committed to the provision of quality health care for older persons.